Maybe you're just in the beginnings of building your workout routine. Or you're trying to surpass a recent plateau. Whatever the case, your current chest workout just isn't netting the results you've been hoping for. To get the chest you really want, you're going to have to train harder. Not only that, but you'll have to start training differently, too. In this post, you'll learn how to take your chest workout to the next level as we discuss how to workout properly and other tips and tricks. Keep reading to find out how to grow your chest muscles. With enough hard work, you might just end up like bodybuilding legend Arnold Schwarzenegger. Before we get into how to perform an effective chest workout, let's have a brief overview of the anatomy of the major chest muscles. The chest is comprised of two major parts. These two muscle groups are called the pectoralis major and the pectoralis minor (hence the phrase 'working out your pecs'). The pectoralis major muscles extend from your collar bone and sternum to the upper arm. The main function of this group includes flexing the arm at the shoulder, rotating the arm at the shoulder, and drawing the arms toward the body. Alternatively, the pectoralis minor muscles extend from the upper ribs to the shoulder blades. The main function of this group is to draw the shoulder blades forward and downward. Some people believe that a chest workout can't focus solely on one group. Others, however, do think that the two muscle groups can be isolated. While the jury might still be out on that, there's no question that the following workout techniques are guaranteed to get you the results you've been looking for. 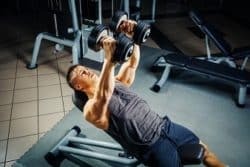 When you begin to develop your new chest workout routine, it's important to consider the differences between the use of free weights and machines. While both can help you grow your strength and muscle size, some workouts are better suited for one or the other. Depending on the goal of your chest workout, consider switching to free weights if you've been using machines, and vice versa. Using machines is a great way to pump out a set of quick reps. However, a machine only offers a limited range of motion. This limited range of motion certainly won't hurt your routine. But it also makes it more difficult to direct your focus to one particular area of your pectorals (more on that later). Free weights, alternatively, offer a wide range of motion. As a result, using free weights leads to greater control over what areas of your chest you're working out, and which areas need the most attention. Furthermore, with this increased range of motion comes the ability to work the lesser used areas of your pectoral muscles. This part of the muscle includes the areas which attach to your arms and back. If you've been using machines in your chest workout routine, you might not have been able to give these areas the work out they needed. As a note, using barbells (rather than actual free weights) also limits your range of motion. As such, you should consider your workouts with barbells to be similar to a routine using machines. However, some exercises with a barbell can hone in on specific areas with the right techniques. When it comes to weightlifting, it's not uncommon for people to slack a little bit. No, that doesn't mean you're hard and fast reps aren't doing you any good. It's more so a matter of taking your time and focusing intently on the areas you're trying to target specifically. Have you ever heard the phrase, "work smarter not harder"? The same logic applies to your workout routine. Rather than quickly busting out your set of reps and calling it a day, slow down and think about what you're doing. Focus on your movements and try keeping your movement within a certain range. This is where free weights show their true worth. Reps with free weights already put pressure on the muscle areas which aren't used often. By slowing your movements and focusing on stability rather than speed, you're finally targeting the areas of the pectoral muscles that you've likely been missing. Additionally, try pausing for fifteen seconds between the up and down strokes of each repetition. Doing so will give your muscles a greater workout. Now to move onto your actual new chest workout routine. Some of these routines you've likely already tried. But have you performed them while considering and implementing the techniques detailed above? If you haven't already, give it a shot. You'll be surprised to feel the burn in areas your former routine couldn't reach, no matter how hard you tried. The incline press is a tried and true routine. Get creative and try alternating between using free weights and barbells to see what works best for you. The incline press is a great way to target the upper chest regions. This is compared to a flat bench press which mostly targets the middle chest section. The incline should be set at around twenty to thirty degrees to get the maximum benefit. Now that you've already worked out the upper chest with the above routine, try moving over to a machine to finish the job. Using a machine is a great way to pile on the weight and crank up the intensity of your workout. The goal here is to increase the amount of tension you experience on both the upward and downward reps. This routine makes for a terrific chest workout. But be careful when choosing what type of weights to use with this exercise. Using free weights can be problematic as the range of motion is taxing on the shoulder muscles and joints. If you're not careful, you could easily injure yourself. If you choose to err on the side of caution, consider using a resistance band. Doing so will prevent shoulder injuries. Additionally, the resistance of the band is the greatest in the range of motion in which your pecs are the strongest. There's no right way to work your chest muscles, but there are always better ways. Consider using your own weight bench to improve the overall quality of your workout. Or try changing the number of reps and the length of your pauses. Whatever routine you choose, take care to lift slowly and intently. With proper execution and enough time, your pecs will begin looking just like Arnold's!